I came across Chocomize yesterday and I so so wish that they shipped to the UK! 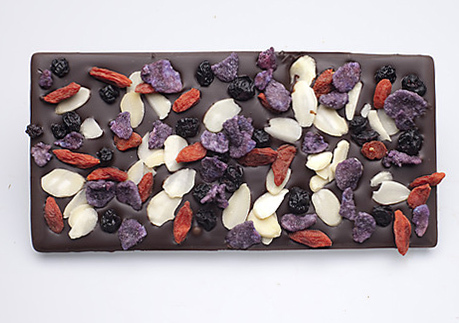 The idea is simple, but brilliant: you can make your own customized chocolate bars. Just pick a type of chocolate (dark, milk or white) and then add up to 5 ingredients… whatever you want. They’ve got a great range of nuts and fruits (the usual suspects), but also some more unique, eccentric ingredients, like black peppercorns, rose petals and even beef jerky. Besides letting you create your own chocolate bars, Chocomize also has a couple of premade popular bars, just in case you have trouble deciding what to put on your own bar. Some of these look great with bars like the Smores bar (mini marshmellows and Graham teddies) or the Tropical Island bar (banana chips, coconut flakes and cantaloupe melon dices). Or my favourite: the ‘I Feel Lucky’ bar, where you get a mystery combination of ingredients! As I said, I so wish they’d ship to the UK (or is there a UK equivalent?) cause I’d love to make my own personalized bar! I’d probably end up mixing white chocolate with macadamia nuts, and adding some special stuff like lavender to liven it all up. What would your personalized bar be?